Lesley Hampton was a ‘third culture kid’ and her early life was one of constant relocation. Formative years spent in Canada’s Arctic and Atlantic, Australia, England, Indonesia, and New Caledonia, added to her quest to establish a personal and cultural identity. Lesley defines herself through the amalgamation of the indigeneity, to her Anishinaabe and Mohawk heritage, as well as, her early nomadic upbringing. Becoming a nomad through experiences with boarding school, international school, adoption, and cross-cultural experiences, Lesley nurtured a passion for socio-cultural concepts, to help define her identity, and reconnect with her indigenous roots. 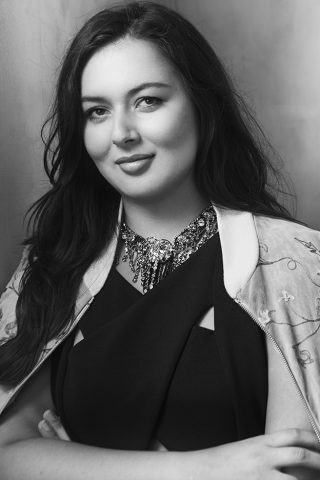 Lesley received recognition for her fashion and entrepreneurial work from the Canadian Arts and Fashion Awards – 2018 Simons Fashion Design Student Award nomination, RBC Canadian Women Entrepreneur Awards 2018 nomination and City MOGULS 2018 nomination.